The airshafts from the Queen’s chamber do not exit to the outside, like those in the King’s chamber. In fact, one airshaft leads to an alleged hidden chamber. If we go back in time and look at the history of the discovery of the Queen’s chamber airshafts, we will find another interesting discovery that few have heard about. Up to 1872, no airshafts were discovered in the queen’s chamber. In that year, Waynman Dixon, an engineer, decided to look for airshafts in the Queen’s chamber, since airshafts were in the King’s chamber. Looking at a section of the southern wall, where he thought an airshaft most likely would be located, he noticed a crack in the wall. Using a hammer and chisel he quickly broke into something. What he broke into was an airshaft measuring about 9 ½ inches square going straight back into the wall about 7 feet and than rising at an angle and disappearing in the dark. Thus he discovered the southern airshaft into the queen’s chamber. Why was this airshaft never finished? It ended several inches inside the wall. He than went to the opposite side, the northern wall of the Queen’s chamber, and did the same with a hammer and chisel and found the other airshaft. It also went in about 7 feet and than started to rise at an angle. Why these shafts were not cut through into the chamber remains a mystery. Dixon found something very interesting in the northern Queen’s chamber airshaft. These objects were brought to England. However, in a short period of time they had disappeared. Recently it was found that they had remained in the hands of the Dixon family and in the 1970’s were donated to the British Museum. They remained there unknown until the 1990’s when they reappeared again. It is interesting to note that the wood artifact was missing. This wood could have been C14 dated and maybe given us the year of the building of the great pyramid of Giza. Why would it disappear? These have not yet been removed. It would be interesting if this wood could be removed and c14 dated. 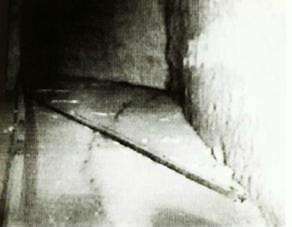 The possibility of discovering hidden chambers or passages in the pyramid have interested man for thousands of years. The thought of finding hidden treasures, or the blueprints of the pyramid, or scientific information and devices of a lost culture have motivated man to search for a hidden chamber within the pyramid. Before this century, the only way of doing this was to bore into the pyramid and by luck hit an undiscovered passage. This has been done in the past and these explorers have left their mark with nothing of significance discovered. Now we have modern scientific instruments to help us with our search. Experiments in the past have been conducted using magnetism, sound waves, etc. with little success. The use of cosmic ray probes, developed by Dr. Louis Alvarez, who won the Noble Prize for physics in 1968, did work but failed to find any hidden chambers. 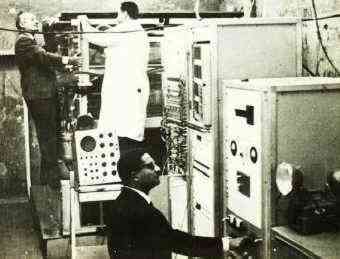 In 1974 a team from Stanford University and the Ains Shams University of Egypt attempted to find hidden chambers using an eletronmagnetic sounder. Its main principle was the use of radio wave propagation to find hidden chambers. Unfortunately, because of environmental problems (moisture, etc.) It was found that this type of device would not be suitable. Different scientists are looking into other means of discovering hidden chambers and passages in the great pyramid of Giza. It is an exciting possibility that one day, maybe a hidden chamber will be found and reveal to us information about our past that we were not aware of. "UPDATE ON THE AIR SHAFT LEADING TO THE ALLEGED SECRET CHAMBER"